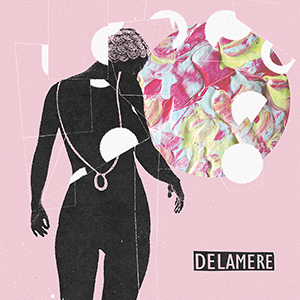 Delamere have been making a name for themselves in the past two years with their own brand of shiny guitar anthems playing to an increasing fan base. Their debut album consolidates that position with four of their singles and six other tracks which remain true to those ingredients that have drawn those people in whilst avoiding the pitfalls of repeating the same trick over and over. Right from the opening bars of Bright Young Things Delamere sets its stall out. Shiny electronic beats form the basis of most of this record and the vocals also have a sheen to them that's highly polished and which point the listener clearly in the direction of the indie dancefloor. But, rather than be staple polyfilla, Delamere and their producer Rich Turvey create enough space on the record for their personalities to shine through. Fitch has an impressive range to his voice which he uses to the full, whether it be stretching it to its limit on Regress or Heart or when he's using it to emphasize his message as in the chorus of So Long. If you're already aware of Delamere then this record will delight you as it distills the formula that makes their live shows so much fun into a shiny silver disc. Not for them the miserablism that many bands trade in, the whole record glows with a positive world view, everything feels very tight, crisp and upbeat and not afraid to lift its cap to acknowledge the influence of eighties electropop that courses through its veins without ever feeling anything but a very modern record. At the centre of the record are three of the singles - Kill It, Black And White Space and Heart - and it's here where they've made their strongest claims for the hearts and minds of the listener so far, although they follow it with possibly our favourite song on the album Woods, a track that shows a softer, toned-down side to their sound that we'd not witnessed before and that we'd like to hear more of. Headstrong heads back for more familiar territory, but makes even more of an impact than the singles with its insistent and infectious non-stop energy disco beat. Delamere is a perfect summer record, a statement of where the band is at this moment, exquisitely crafted songs with lofty ambitions and expansive boundaries that they fill out with their sound. It manages to have a very clear and coherent continuity of purpose without ever feeling like it's on a repeat loop and it doesn't forget that music should be fun either as anyone who's seen them live will confirm. Delamere tour the album at Leek All Saints Church (August 19), Hull Polar Bear (23), Banbury Also Known As (26), Ashcombury Festival (27), Birmingham Actress And Bishop (28), Leeds Sofar Sounds (30), London Old Blue Last (31), Bournemouth The Anvil (September 2), Dundee Buskers (8), Edinburgh Mash House (9), Manchester Academy 3 (10), Bradford Underground (16), Ramsbottom Festival (17) and Leeds Eiger Studios (also 17).